In the past, there has been the occasional bloodshed in blues jukes, sometimes even becoming the stuff of legend. These days, one would hardly expect even a little fist-fighting in a blues club, much less a homicide-suicide bombing. In Israel however, that is never outside the realm of possibility. 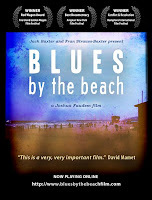 Filmmaker Jack Baxter learned this all too well while making Blues By the Beach (trailer here), a documentary which plays May 5th at the Two Boots Pioneer, and is also available online as part of the digital delivery revolution. Baxter originally travelled to Israel with plans of filming a documentary about a terrorist facing trial. When he arrived at the courthouse, Baxter found his prospective subject was already well covered by another filmmaker, and frankly not that interesting. Baxter planned to pack up his gear and leave, but happened to wander into a Tel Aviv blues club on his supposed last night. 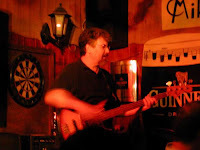 He found Mike’s Place, a beachfront club featuring a mix of blues and related blues-rock. The managing co-owner, Gal Ganzman, had created an oasis of American ambiance that drew a decidedly mixed patronage. Everyone in Mike’s spoke English, but never discussed religion or politics. When Baxter saw Israelis, Palestinians, Americans, and Europeans, all peacefully coexisting at Mike’s, he figured he had his story. Baxter hired bartender Joshua Faudem and Faudem’s Czech girlfriend, Pavla Fleischer, to be his crew and started interviewing the people of Mike’s, expecting a narrative to take shape. Unfortunately, it did. On April 30, 2003 a suicide bomber walked into the club, changing the lives of everyone there and tragically altering the trajectory of the film. Three people lost their lives that night: Dominque Hass, a Mike’s waitress covering for someone else on her night off, and musicians Yanay Weiss and Ran Baron. Seriously injured in the blast was the bouncer, Avi Tabib, who spotted the bomber, preventing far greater carnage, and Baxter himself. The director would become the subject, as Faudem assumed the directorial duties. Each death is painful for the people of Mike’s, but the loss of Hass is particularly shocking to the audience. Bright and attractive, Hass was established as one of the lead voices of Beach before the cowardly attack. Losing her presence in the film makes Beach feel unbalanced, incomplete—which is the point. That is the messy reality of terrorism and the resulting sense of loss. Beach is not a film of strikingly composed images. Rather it was about having the camera pointed in the right direction when something important happened, and capturing the drama unfolding. This is not an academic exercise, offering excuses for the killers (who happened to be British nationals). It is about a savage act of violence, and the efforts to deal with the resulting emotional and physical scars. It is as real as it gets. Faudem did indeed finish the film, but the experience would prove trying. Baxter recovered to see the film through into release as co-producer and will be taking questions at Two Boots after the screening. If you are unable to attend, you can watch it pay-per-view style online by following the links on their website. This is not wholly unprecedented. IFC has been releasing simultaneously to theaters and cable pay-per-view for sometime. Beach has been playing the film festival circuit and has been screened theatrically, so it has credentials that other films opting for this distribution path might not necessarily have. It is undeniably convenient and the picture and sound quality of their portal is quite good, so I would not be surprised to be reviewing more films in this format in the future. (It also saves on the cost of a screening or a screener). Regardless of the format, Beach is an intimate film, showing the effects of terrorism in very concrete hum an terms. Mike’s Place looks like the sort of spot I would hang at if I were in Israel. The music we hear in the film by Barry Gilbert and Sobo is actually pretty good and the people seem friendly. That is why Beach is so disturbing. It introduces us to a place we, like Baxter, would feel so comfortable in, and then see it senselessly bombed out of sheer hate. Beach is a brutally honest film, well worth seeing.